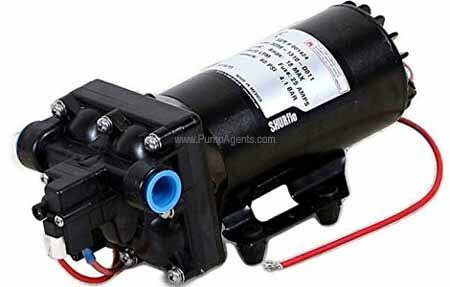 Shurflo catalog # 5050-1310-H011, Diaphragm Pump with 24 Volt DC Motor and Automatic Switch. Polypropylene Pump Body, Viton Valves, Santoprene Diaphragm. Inlet Port is 1/2 Inch NPT-F, Discharge Port is 1/2 Inch NPT-F. Comes with 14AWG Motor Wire: 12 Inch. The Shurflo 5000 series pump was created with a unique one-piece co-molded diaphragm, assuring long life and top performance in any system. The 5000 series pump is built for powerful, smooth flow. Shurflo pumps have a quality reputation that has been built on the reliability and dependability of every pump we build. The 5000 series automatic demand pump is powerful, and can run dry without damage. Inlet Port is 1/2 Inch NPT-F, Discharge Port is 1/2 Inch NPT-F.
24 Volt DC. 14AWG Wire: 12 Inch.